All the pieces are in place for the Denver Broncos to shake off a disappointing 9-7 season and make a return to the playoffs for 2017. The defense looks to be fortified up front with acquisitions like Domata Peko and Zach Kerr and the improving Adam Gotsis. The special teams unit returns all of its specialists while having added “juice” to the return game with the addition of electric rookie returner, Isaiah McKenzie. The offense should also be markedly better with improved trench work from free-agent pickups in Ron Leary and Menelik Watson to go along with improved team speed in Jamal Charles and third-round selection, Carlos Henderson. 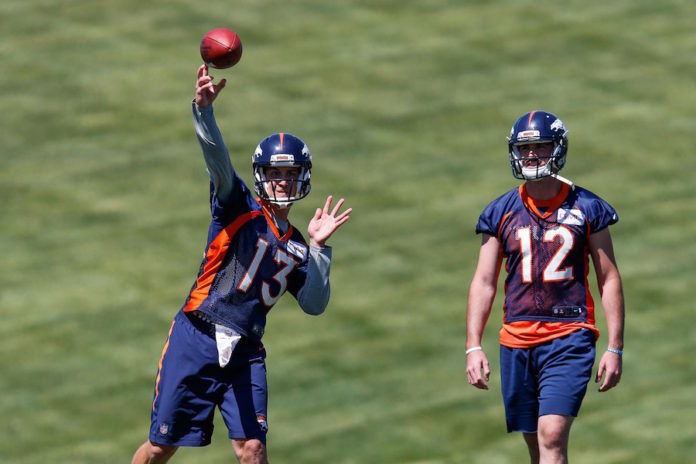 As far as who will be steering that ship is anyone’s guess, as the battle for the starting quarterback job between second-year player Paxton Lynch and incumbent Trevor Siemian figures to be decided by end of training camp at the earliest. Quarterback competitions are rife for over-analysis as is. With each player being stronger in different aspects than the other, it brings an interesting dynamic to the surface. The scrutiny that either signal-caller faces is that much more amplified with the other being on the roster. Take, for example, the supposed leadership deficits of Lynch and compare them to Siemian from last year. As a green, untested second-year player, Siemian grew into the role as the starter as the season wore on, gaining praise in his command of the huddle from both his teammates and his coaches, no small feat among an NFL team. That comes with the assumption that Lynch won’t be the leader that Siemian is due perceived character flaws like being too affable or lacking in focus. During his college years at Memphis, Lynch’s teammates and coaches never showed any displeasure with him, nor did he show any kind of personality flaws that would keep him from being a leader when it came to playing the most important spot on the football field. In all reality, former Memphis wideout and Broncos 2016 training camp player, Mose Frazier, was quite complementary of Lynch, not only as a player but of how much former Tigers loved Lynch and how much of leader he was in college. However, and as unfair as it might be, Lynch will have to prove himself the way Siemian did a year ago to dispel those myths, all the while having Siemian as his competition. Likewise, Siemian will have his abilities questioned, as long as better physical talent is looking over his shoulder in the form of Lynch. People forget how much of an athlete the former Northwestern Wildcat is, at least when it comes to comparing him to the bigger, more obvious specimen, Lynch. Siemian, last season, showed good mobility and some elusiveness when escaping pressure and has shown to have a quality, NFL-quality arm to go along with being an smart overall player. Yes, Lynch has a cannon for an arm and, after seeing him push the ball down the field in relief of Siemian against Tampa Bay, it’s hard to not get caught up in seeing him cut it loose. That’s why Siemian is also unfairly labeled as being a dink-and-dunk passer, even though he has shown his own arm strength as a collegian, whipping the ball around in a windy, come-from-behind win versus Notre Dame in 2014. Even though the perception exists that Siemian is the lesser of the two physically, he is more than qualified athletically to handle the rigors of playing quarterback at the NFL level; it is just harder to see with someone like Lynch already on the team. On top of the enormous demands placed on a player as the starting quarterback of an NFL franchise, Siemian and Lynch will have to work that much harder to dispel the misconceptions that are circling as the team gets ready for training camp. While either quarterback may be better off not having to overcome the internal conflict of having to beat out the other, we can only hope that the adage of “iron sharpens iron” will make this year’s starter, whoever that may be, the better man for overcoming that adversity.